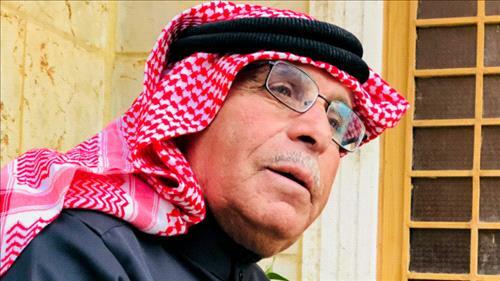 AMMONNEWS - Abu Jawad al-Kasasbeh, the father of Jordanian pilot Muath al-Kasasbeh who was burnt alive by ISIS in Syria, said Saddam Omar al-Jamal, one of those involved in killing Muath and who was recently captured in Iraq, should suffer a fate worse than that of his son. In his first interview after the Iraqi authorities announced the arrest of five ISIS chiefs, including Jamal, Abu Jawad said he cannot imagine what would happen if he ever comes face to face with his son’s murderers. “What do you expect from a father who is grieving his son and whose murder shook the entire world?” Abu Jawad asked. Asked how he felt when he heard the news that Jamal was among those arrested, he said a fire raged inside him, adding that Jamal’s punishment must be worse than how Muath was executed. “I see Muath in my prayers, when I put my head on the pillow. I see Muath every second, and I mourn him every day,” Abu Jawad said. Abu Jawad called on the Jordanian government to bring Jamal from Iraq to Jordan to try him, adding that he was expecting the interrogation of ISIS officials to reveal more about the secrets of capturing Muath and executing him. He also said that he has not asked to meet with Jamal if the Iraqi authorities hand him over to Jordan, adding that he will consider this if Jamal was handed over. Abu Jawad, who did not hide his desire to avenge from all those involved in burning Muath to death and see them die the same way he was killed, said his sons never watched the video of the killing and never think about watching it.